"Fried chicken doesn't get much better than this. It's really good." In a shallow dish, combine the biscuit mix, pecans, paprika, salt, poultry seasoning and sage. Dip the chicken pieces in the evaporated milk then coat generously with the pecan mixture. Place pieces in the prepared baking dish and drizzle with the melted butter or margarine. Bake at 350 degrees F (175 degrees C) for 1 hour or until juices run clear. 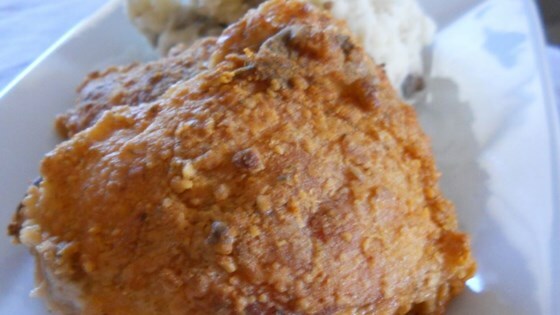 See a delicious, healthier way to make fried chicken. This is an incredibly easy and delicious recipe! I used boneless, skinless chicken breasts so it was healthy also. The flavor is great and smells good when it bakes. thanks for a great recipe! Needed more salt in the walnut mixture. I didn't think it was anything special. I substituted the whole chicken for chicken breast tenders. They came out delicious and perfectly crispy. The only ingredient I did not add was the pecans. It is a great, easy recipe! Very simple and yummy! If you drain them on a paper towel after they are cooked they are not so greasy.